Let’s talk about some favorite fall soups! 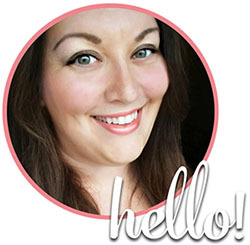 This week, I’m on a business trip to a blogger conference in Portland, Oregon. I’m SO excited to implement all the things I’m learning to be a better resource for all you lovelies. While it was 86 degrees yesterday back home in Minnesota, the Pacific Northwest is already creeping into the chilly fall weather. It was 53 degrees the other morning and sunny, PERFECT fall weather in my book. As the weather starts getting colder, I’m starting to think about hearty fall soups! I love making soups and chili as autumn rolls in. It is so nice to have an easy but flavorful hot meal on the start of those brisk days. I like to pair fall soups with bread bowls, although we don’t do this as much since we started eating low carb. There are some great fall soup recipes for the crockpot but sometimes I love simmering them on the stovetop too. Either way, it’s a win. This recipe from Our Life Tastes Good has me SO excited. Pot pie is such a decadent comfort food, and one of my husband’s favorites, so I can’t imagine this soup not being a delicious bowl of goodness. This soup starts out with roasting a large chicken breast or two depending on what you like the consistency to be of your soup. Don’t skimp on the roasting your own chicken step because this is what make the flavors really stand out. (If you’re short on time, rotisserie chicken from the grocery store would work for this as well.) When you add in baby carrots, celery, onion and frozen peas it melts into the creamy based soup and is sure to satisfy any hungry bellies. This One Pot Tomato and Basil Tortellini Soup was created by Gal On a Mission. It is delicious the day that you make it, but if you make enough for leftovers the next day, it is even better! It seems that allowing the fresh basil and creamy soup to soak into the tortellini overnight a whole ‘nother level. This starts out with a traditional chicken broth stock and develops into a creamy tomato basil soup. The final step is to add store bought 3 cheese tortellini and cook until tender. Easy as that you have a delicious one pot dinner! Mushrooms, wild rice and gruyere cheese, what’s not to love? This Chicken, Wild Rice and Mushroom Soup is hearty and cheesy. My husband LOVES mushrooms, so I can see this recipe by Simply Stacie becoming a fast favorite in our house! 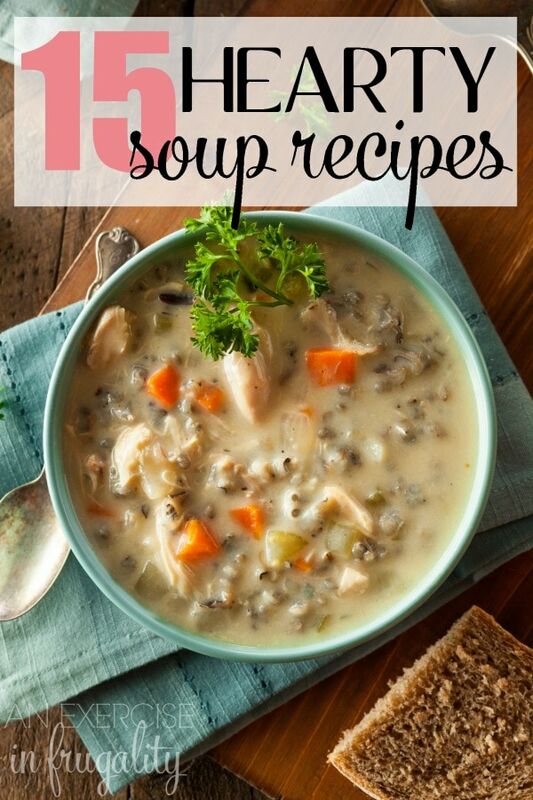 Chicken wild rice soups are kind of a staple here in Minnesota, so anything in that family is right up our alley. Perfect hearty fall soups make perfect cozy comfort food. I think having a go to, Easy Chicken Noodle Soup is so important with the cold weather coming. This recipe is full of flavor and hearty veggies. You can use any type of pasta you have on hand. Always keep chicken legs and thighs on hand in the freezer, if you stock up when they go on sale you can throw them in a pot and be enjoying this hearty fall soup on no time! It is a fairly quick meal and is always good to have on hand. You can freeze this without noodles and add them when you heat the soup to prevent them from getting mushy. Also you can make a big batch and freeze in containers to deliver to friends who are sick this coming cold and flu season. It would be a great addition to a get well gift basket! This recipe is by Natasha’s Kitchen and utilizes the traditional carrots, celery and onion. It would not be fall without a potato soup or a cheesy broccoli soup. How about both!The main ingredients of the Loaded Broccoli Cheese Potato Soup are all cooked in a soup pot, little by little. The butter and flour are cooked in a large sauce pan with the milk being whisked into it. The cheese is then melted into the velvety bechamel and added to the broth in the soup pot. It all simmers together for a delicious taste of a loaded potato, soup style. This recipe was created by Lil Luna and is sure to become a staple hearty fall soup in your house. This is the perfect example of sweet and savory in a one pot soup. It can be served warm or chilled depending on what style you like best. It is topped with a little walnut granola topping.This is definitely one of the more unique flavors on my list here, but it’s something I really want to try! The soup is made with fresh apples, apple cider, brown sugar or maple syrup, brie, garlic, cheddar cheese, some seasonings and topped with a walnut oat granola. Closet Cooking created this unique spin on some fall favorites and I think it might be going on the Thanksgiving menu this year! Apples and cheddar are yummy, and brie is one of my favorite cheeses, so I’m pretty certain I’m going to love this unique fall soup! What’s not to love about tacos? This Taco Soup from The Diary of a Real Housewife is fast and easy to make for a quick dinner and has a great flavor. Your family can use their imagination to decide what toppings they like on the soup just like a taco! Favorite toppings are cheddar cheese, sour cream and crushed corn chips. The recipe uses black beans, corn, green chilies but you could add other veggies like diced tomato, green pepper, etc. The heat of this dish can be adjusting with seasoning as well. This soup from Cooking Classy is made with colorful peppers, chicken, garlic, lots of seasonings and rice. It is all cooked in a pot with broth like any soup and fire roasted tomatoes are added for an added zing. The chili powder does not make it spicy, but provides a great flavor. The black beans actually add a nice flavor and make the soup heartier. Top with cheese and sour cream for the perfect hearty fall soup! First, I have to admit I have never tried a bean soup before, but this one from Taste and Tell sounds delish! The key to this recipe is the smoked bacon I’ve been told. And what’s not to love about bacon? I mean really, you had me at bacon and we could have just skipped all this. Why are we still talking? Why am I not eating bacon right now? So this recipe from Cearas Kitchen is vegan and gluten free but it is not lacking in anything. The difference in this soup is the roasting of the tomato, onion and garlic. The roasting part adds an hour on to your cooking time but once you taste the difference you’ll see why it’s worth it! After roasting you can add that to a pot with the seasoning, water, coconut milk and hot sauce to your taste. Blend it all together and simmer for about 5 minutes and it is ready to serve. This is a classic soup that is always a crowd pleaser. The caramelizing of the onions is a little time consuming but well worth the wait. Once you have that beautiful brown caramelization complete, the rest of the soup crafting is easy! Having soup crocks make the serving of onion soup much easier. The crocks can go in under the broiler to melt the cheese on the large bread crouton. This recipe from Gimme Some Oven is so good and the only problem with it is that you’ll have to make double because everyone loves it! For a unique flavor twist, you can also try my Bourbon and Beer French Onion Soup, to really warm your bones; it really is one of my favorite fall soups if I’m being totally honest! This is a hearty soup that utilizes lots of Fall veggies. I like the combination of kale and sweet potato together. The sausage adds a little something extra as far as flavor and helps to make it a hearty meal. I then add some drained red beans and about 4 cups of kale to complete this dish. Be cautious with the chili powder until you taste it bit by bit. It’s easy to overdo it. Easy to make and delicious flavors. The recipe is by Cooking Classy. The recipe from Pinch and Swirl calls for a sweet Italian sausage but for a little kick you could do a hot sausage. The sausage combined with onion, carrot, celery, crushed red pepper and a combination of chicken and beef broth tart this soup off with a great base of flavors. Add pasta and tomato and broccoli rabe to the pot to cook and finally some cannellini beans. The soup has some additional spices to simmer in and it is ready to eat. Sprinkle some fresh parmesan cheese on top for the final touch. Mangia! I love a great creamy chowder to have in my repertoire of hearty fall soups. This Creamy Chicken and Corn Chowder from Cooking Classy is a good way to use up any corn you may have frozen over the summer. The soup has potatoes, peppers, chicken and bacon in it for a great blend of flavors. When putting in the seasonings remember you can use some seeded jalapenos for a little heat if desired. The half and half makes this dish creamy. This would be perfection served with some crusty bread! Mmmm…. Please excuse me while I try to stnop drooling, because these all sound FAB. Keep in mind you can make double batches of all of these fall soups and freeze them for a night when even making a soup feels like just too much effort (and believe me, I have been there!). If these fall soups are getting you in the hygge mood, be sure to check out these DIY fall decor ideas to get the rest of your home ready for the best season of the year! 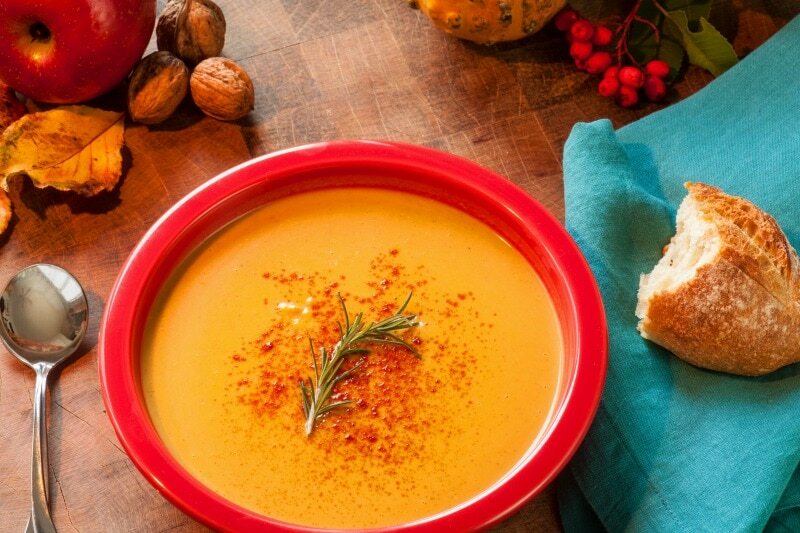 Which of these hearty fall soups are you most excited to try?